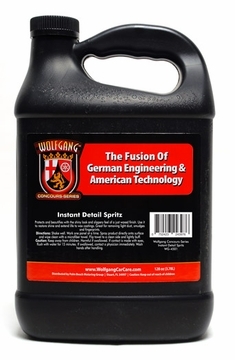 Home > Wolfgang Product Line > Wolfgang Instant Detail Spritz 128 oz. Free Bonus! Wolfgang Instant Detail Spritz 128 oz. Free Bonus! For a limited time, Receive a FREE 12 oz. refillable bottle with your purchase of the gallon size of Wolfgang Instant Detail Spritz! Now there is no need purchase a separate bottle, just to use your favorite Wolfgang Product! Attain that "just-detailed" look--anytime, anywhere--in minutes! Wolfgang Instant Detail Spritz is a technologically advanced formula with a chemical blueprint that puts it well ahead of the pack. Drawing from ground-breaking developments in modern chemistry, the specialized ingredients in this high-lubricity spray deliver unparalleled surface enhancement--clarity, intensity and shine. Though most cars can be misted and buffed in less than five minutes, it will look like you've spent all day laboring on your vehicle. Wolfgang Instant Detail Spritz is formulated with high-tech German super polymers. These highly-reflective polymers form an ultra-thin protective coat that bonds to the paint sealant or wax finish and leave your vehicle with a slick, silky surface—plus Instant Detail Spritz extends the life of the sealant or wax with regular use. In no time, you have gorgeous results. 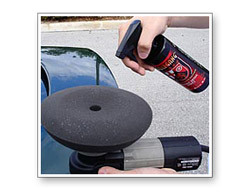 Simply spray on a small area of your car. Use a microfiber towel to wipe away fingerprints, water spots, dust, and other harmful contaminants, leaving behind a rich, spectacular shine. Wolfgang Instant Detail Spritz performs even in hot, humid climates without streaking, cloudiness or hazy patches. 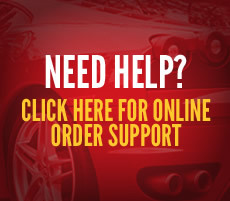 It works exceptionally well on black and red cars, an unusual feat for a true detail spray. Instant Detail Spritz is the perfect wipe down for show cars or in-service limousines. The lubricating oils in Wolfgang Instant Detail Spritz wrap around dirt and dust to prevent scratching as contamination is wiped off the paint. This ultra-slick detailer leaves paint looking healthier, with deeper colors and a silky texture. Wolfgang Instant Detail Spritz was created to complement Wolfgang Deep Gloss Paint Sealant 3.0 but it is compatible with all paint sealants and synthetic waxes. Use it after washing the vehicle or any time to refresh the shimmer of the existing paint protection. Wolfgang Instant Detail Spritz is a water-based detailer, built around the polymer structure of Wolfgang Deep Gloss Paint Sealant 3.0. Allow the detailer to cure for at least an hour before applying another coat. Restore a just-detailed gloss to any vehicle with Wolfgang Instant Detail Spritz. The polymer, water-based detail spray revitalizes existing paint protection in minutes to recreate the striking impression of a freshly detailed vehicle. Just spray and wipe to instantly boost the shine and depth of your vehicle's paint. After washing your vehicle with Wolfgang Auto Bathe, mist the paint with Wolfgang Instant Detail Spritz as you towel dry the vehicle using a Cobra Guzzler Waffle Weave Towel. This will prevent water spots and enhance the shine in one quick step. Between washes, mist one section of paint at a time with Wolfgang Instant Detail Spritz. 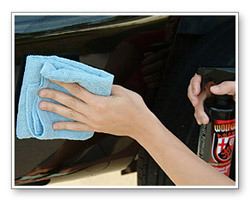 Use a plush towel such as the Cobra Deluxe Jr. Microfiber Towel to gently buff your vehicle to a deep gloss. Detailing Tip: Mist unused buffing pads and applicators with Wolfgang Instant Detail Spritz to lubricate and soften the foam.